I remembered On Her Majesty’s Secret Service (henceforth known as OHMSS) as one of the better Bonds, despite being poor George Lazenby’s only turn as 007. Was I wrong? Does it hold up? It must’ve been a blow to producer Albert Broccoli when Connery resigned from the role of James Bond at the start of production on You Only Live Twice. Australian George Lazenby (who certainly looked the part after impressing producers in a Bond-like Saville Row tux) cinched the role when he punched a stuntman and showed his violent side. OHMSS would end up being his only film as Bond (after his bone-headed agent gave possibly the worst advice ever, convincing Lazenby that the square Bond was out of fashion against the prevailing counter-culture), but is it any good? Hold up – when do the vocals kick in? Oh, they don’t. It’s a funky, upbeat theme that’s heavy on the moog, but it’s jarring to hear an instrumental after some great opening songs in films past. Aware that Lazenby has an uphill battle to establish himself as Bond, the filmmaker’s try to soften the blow by playing some greatest hits scenes from the last few movies projected into a martini glass. It’s unimaginative and lacks the allure of previous title sequences, the first warning sign of many. There’s a lot about OHMSS that flies in the face of previous Bonds. The opening, as opposed to being unconnected to the main plot, actually introduces female lead Tracy (Dianna Rigg) and has Lazenby’s Bond commenting directly on his re-casting by saying “This never happened to the other fellow” as Tracy speeds off. After again meeting up with Tracy in the requisite casino scene (and bailing her out), Bond is abducted by European crime boss Draco, who turns out to be Tracy’s father. Bond’s still hot on the trail of criminal mastermind and SPECTRE head Blofeld, and in a supremely uncomfortable exchange Draco dangles info on Blofeld if Bond will agree to marry Tracy (“What she needs is a man to dominate her” are Draco’s jaw-dropping words). Bond goes to Switzerland and poses as a fey genealogist by the name of Sir Hilary (“Call me Hilly”) in order to infiltrate Blofeld’s base high in the Alps. After much sneaking around, he discovers that Blofeld’s nefarious plan turns out to be… allergy research? This is a weird movie. OHMSS ranks as Bond’s longest film to date (at 142 minutes) but turns out to be comparitively light on the action. The opening fist fight is suitably thuggish, but director Peter Hunt favoured a choppy editing style that sometimes feels erratic. 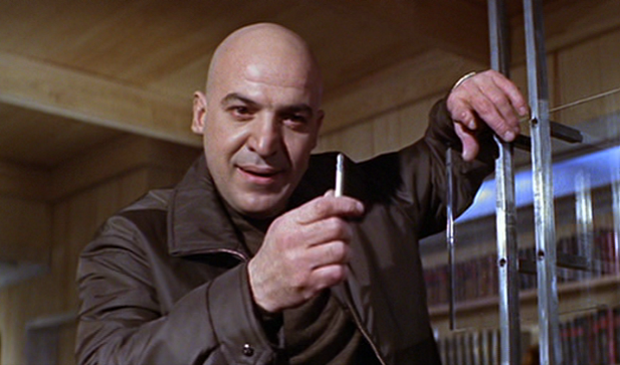 Blofeld is again played by a different actor – the great Telly Savalas. Unfortunately he’s given little to do, as producer’s wanted a more grounded plot that still finds Blofeld seeking to hold the world ransom lest he sterilize the population through… mind control? And allergy research? I wasn’t clear on that. What I’m saying is he doesn’t have a pit of sharks or even piranhas, and doesn’t really get to be too menacing. He does hold his cigarette in a unique way, which is something. After a flabby second act the action finally picks up, and features an extended ski chase down a snowy mountain (with some iffy blue screen effects but gorgeous scenery), that leads to car chase through a quaint Swiss town, and eventually another ski chase. Lazenby’s Bond is more stoic but still chirps “he had lots of guts” after throwing a baddie into a snow machine, a crimson arc spraying across the white snow. The finale ratchets up the stakes as usual, with a helicopter assault on Blofeld’s compound that leads to a bobsled chase between the two arch enemies. Bond throws Blofeld into a tree quipping “he’s branched off”. Heh. And then comes possibly the weirdest ending of any Bond movie ever. Tracy and Bond have a combative frisson at first, but grow to genuinely love each as Bond declares “I love you” (a series first!) before proposing to her (“Mr. and Mrs. Bond”). This is another series first, not counting the sham marriage from You Only Live Twice. 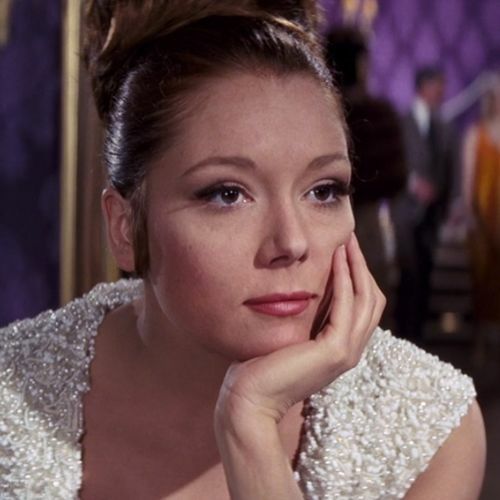 And while Diana Rigg (hot off the show The Avengers) is good as the firebrand Tracy, she doesn’t have a lot of chemistry with the relatively novice actor Lazenby. Part of the problem is that Tracy disappears for a large stretch in the middle of the movie as Bond proceeds to sleep with a whole gaggle of women at Blofeld’s mountaintop resort. All the girls are garish stereotypes of their respective countries of origin, and Bond goes about bedding Ruby (English) and Nancy (Hungarian), and I think a third and maybe fourth. He even has to schedule them and uses the same lines on each (which is one of the few genuinely funny moments). It could be more madcap and jokey, but the austere OHMSS decides to mostly play this part straight as well, missing an opportunity for cheeky fun. Overlooking some now-dated effects work, the ski chase scene is extended and pulse-pounding. Bond sliding down ice shooting a machine gun in the climax is an image for the ages, and though Lazenby could be stiff at times he sold the action. The big kicker – at the end of the film a newly married Bond and Tracy are riding off into the sunset on their honeymoon when they encounter some roadside trouble and BLOFELD KILLS TRACY! Bond is devastated and starts weeping, and then the movie ends. In case you were wondering, Bond’s last word’s to his beloved wife were “Mrs. Bond, shut up.” He may have a few regrets. The producers were keen to showcase a more realistic Bond here, but it means a more languid pace that threatens to kill any momentum built up in the opening. The middle section really sags and despite some spectacular action in the final third OHMSS still seems like a lot less fun compared to the Connery entries that preceded it. I don’t think Lazenby’s the problem, as he’s a little wooden at times but probably would have grown into the role if he’d decided to stay. It’s more director’s Hunt desire to put his own stamp on the Bond series and kill some of the sacred cows. Q’s inventions are derided, Bond threatens to quit MI6 and many of the series’ recurring hallmarks are missing in action. James Bond, both the character and the films, would eventually need reinvention many times over and in fact thrive on some fluidity, but unfortunately here it was just too much too soon. OHMSS is a noble failure and not nearly as good as I recalled, and I can’t in good conscience put it above any of the first five Connery efforts. Extra points for the insane ending though, which is totally out of left field.